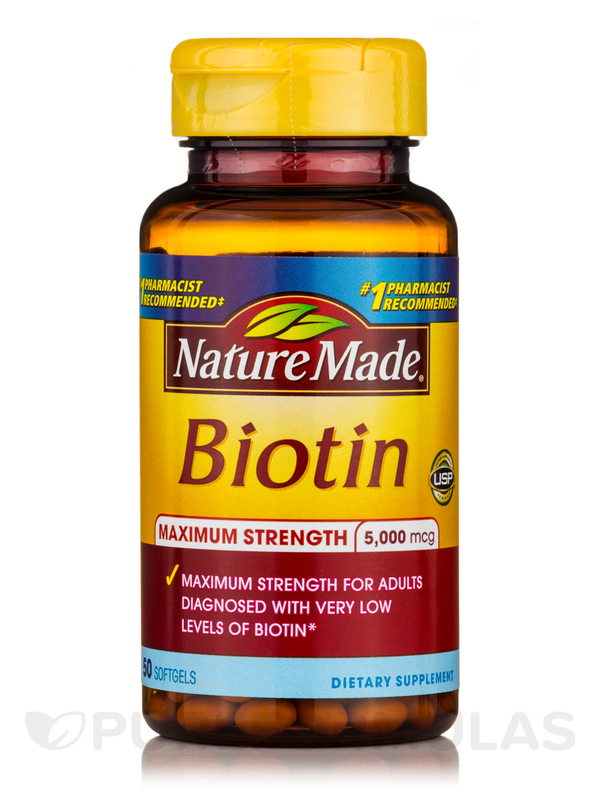 Biotin 5000 mcg Maximum Strength by Nature Made is a good supplement for hair growth and strength. Be sure to drink plenty of water with it too as well. 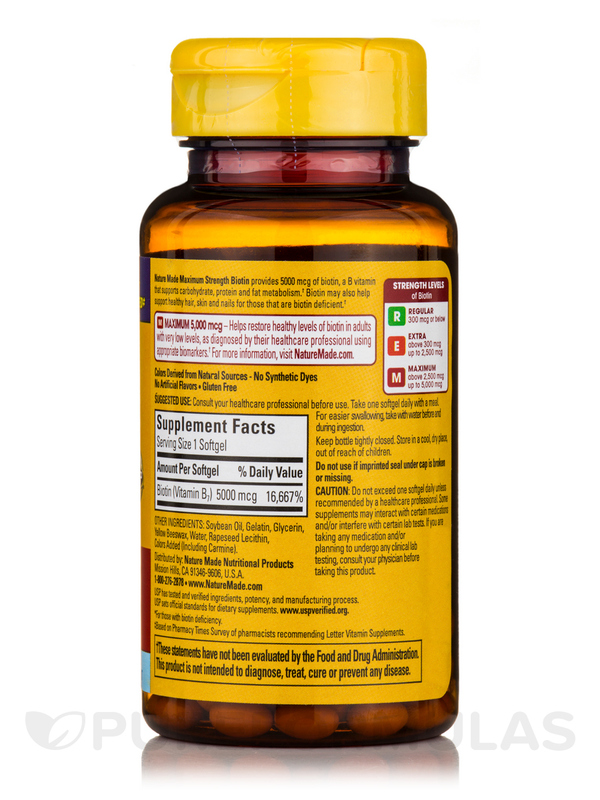 Biotin 5‚000 mcg Maximum Strength – 50 Softgels from Nature Made® is a gluten-free supplement that enhances your intake of the important B-complex vitamin biotin. Intestinal bacteria may also produce biotin. Biotin present in this supplement from Nature Made® works with pantothenic acid to produce enzymes that catalyze biochemical reactions in the body. Biotin plays a role in the breakdown of carbohydrates‚ fats and proteins from foods. Studies reveal that diets deficient in biotin may hamper the production of the pancreatic hormone insulin. Biotin helps the body use glucose‚ thereby balancing the blood sugar levels in the body. Many people believe that biotin could strengthen weak and brittle nails. It may help the skin stay taut and hydrated by helping build fat in the skin. It could also slow down hair loss. Apart from this‚ biotin may maintain healthy nerve function. This formula may be helpful to individuals who may have very low levels of this B vitamin. 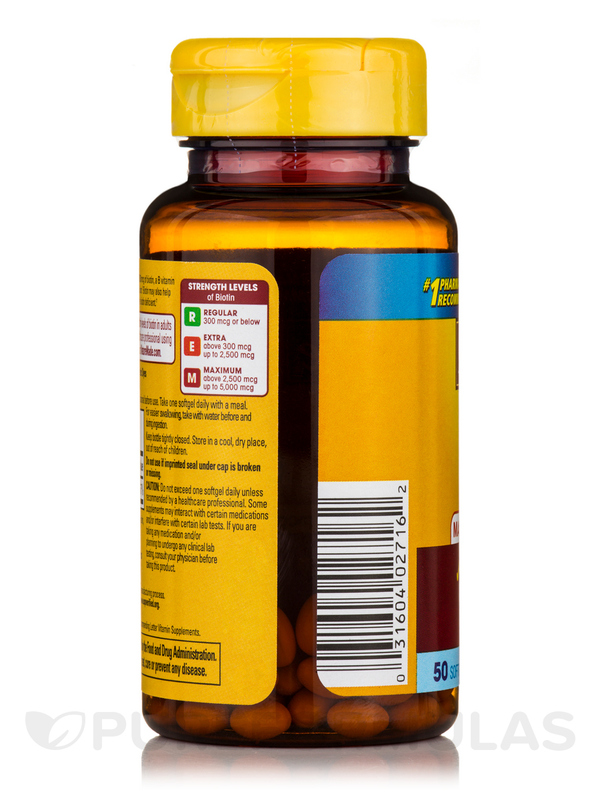 Get Biotin 5‚000 mcg Maximum Strength – 50 Softgels from Nature Made® and balance blood sugar‚ energy levels‚ nail and skin health. Other Ingredients:Soybean Oil‚ Gelatin‚ Glycerin‚ Yellow Beeswax‚ Water‚ Soy Lecithin‚ Colors Added. Consult your health care professional before use. Take one softgel daily‚ with a meal. 3) Impaired drug and/or supplement absorption. As ingredients may change from time to time‚ please check the label on the bottle. Biotin is a miracle vitamin! I am in my early 40's and I started to notice that I had thinning hair in my crown (front) top and right side. What a heartache. I had really thick hair when I was a teenager. I had considered other options. But I read that biotin helps strengthen hair. Worth a shot. Well I've been taking Biotin by Nature Made for 2 months now along with Rogaine Mens Extra Strength and the good news. At the two month stage a really substantial amount of my hair grew back. I know that Rogaine helped grow my hair back, but biotin helped strengthen it. That with a really good anti dandruff shampoo and my hair has grown back on my right side and in the center. My hair now has layers to it. I have my old hair back. It really works. Easy to take in the morning with orange juice or water. The pill is extra small for easier swallowing.